I will introduce idea of remote monitoring and controlling of external application based on OSGi platform. Its implementation will be a modified Plugin Registry view. At first I will try to present the meaning of OSGi in Eclipse environment and opportunities to use this view. Additionally, I will present the concept of project’s implementation. The main aim of this project is to provide remote management of application based on OSGi platform. I am going to show meaning and main application of it and then I will present importance of this project. Firstly, we should know what is exactly OSGi. So it is a platform which provides an opportunity to us to create modular applications. In this case, module (in OSGi called bundle) is an independent single unit, which is a logical whole entirety and can be installed and uninstalled separately. The main feature of modules is that they should not be concerned with the internal implementation of other modules that it interacts with. It allows us to change the implementation of one module with no need to update all other modules that use it. The standard unit of deployment in Java is the JAR file but OSGi’s bundle has some advantages above it. Mainly, bundles allow us to define explicit dependencies between them. Also we can exactly define in manifest file which version of each library our bundle needs, so more than one version of each library can residence in the same application. Additionally OSGi default makes packages inside one bundle private for others because we only describe in manifest which packages can be imported by others. The crucial thing in OSGi is that it is a dynamic module system for Java. It allows us to install, uninstall and update all modules without restarting or even stopping application for these operations. At once we can think that OSGi is an ideal platform for each application server but it can find implementation in other environments (e.g., handheld devices, IT managed environments). In Eclipse community OSGi is very important because whole Eclipse platform is based on it. It causes that creating new plug - ins and development of all environment are so simple. In this case we can notice requirement of application which allows monitoring modules within OSGi application. In an Eclipse environment we can use Plugin Registry view. Unfortunately it only allows monitoring modules in Eclipse instance in which it is working. However, it seems an ideal basis for the project. Generally project will realize communication between an application based on one of the OSGi implementations and monitoring plugin on an Eclipse instance. It will be based on client – server architecture. In this communication external application will be a server and our view in eclipse will be a client. A server provides information about bundles and services which is interpreted by our application (Plug-in Registry view). Additionally it should make available operations on individual bundles, such as starting and stopping them, installing new bundles and uninstalling old ones. This application allows for example remote supervision of servers based on OSGi implementation so we can react immediately on any problem on the server side when it occurs. All functionality will be provided by modified Plugin Registry view. Method of presentation will be slightly changed. Bundles and services of each application will be grouped by its name. It should by enough clear and transparent for a user. Most of the functionality should be realized by additional operation in Plugin Registry view (starting, stopping modules, installing, uninstalling). Of course not all of OSGi implementations provide all of these operations so server application must provide information about OSGi implementation to a client. For example remote installation of bundles on Equinox can by impossible. On the basis of this information it should provide only permitted functionality. View with connected external applications should allow to add new ones, removing and insight into the basic information about them. Whole project will be part of Eclipse SDK, so will seamlessly integrate with it, but will also keep minimum dependencies on it to be possibly bundled as a separate Eclipse RCP application. The first step of implementation should be the choice of the first protocol which will be used to communication with external OSGi applications. It must be enough simply for this phase. The basic method of connecting is a standard socket interface. This solution is partly implemented in bug number 243439. In my opinion this solution should be considered before we decide for other protocol. If we accept this, further development should be focused on its completion. It is very important to choose good format of data which will be send by a socket. We can choose objects serialization and in this case is important to implement good validation of objects because it is crucial. We can also think about some kind of encryption. The Java Cryptography Extension (JCE) provides support for encryption of serialized objects. If we use a XML format, we must choose another way to do this. After that we have to adapt Plugin Registry view to handling remote connection (e.g. making and breaking it). After connection with external application our agent should download information about all bundles and services installed on this one. Supervision should be in real – time (any change of bundle’s state must be seen immediately in monitoring application). In such case, server must send information about changes to client application. More efficient is to send only description of the change (e.g. which bundle change its state and what is a new state). Another way is to send whole object. In the second solution update of model in a client is easier. We have to think which solution will be better. On this phase we achieve functionality of Plugin Registry view but with remote monitoring. At this point, another task would be to add further functionality: remote operation on bundles and even installing new bundles in external application. After this phase we should start implementation of the second universal protocol. Unfortunately on this stage of designing we cannot clearly choose the best one. There are several possibilities. One of them is JMX (e.g. org.eclipse.equinox.monitoring). Another possible solution would be to use the Eclipse Communication Framework (ECF). 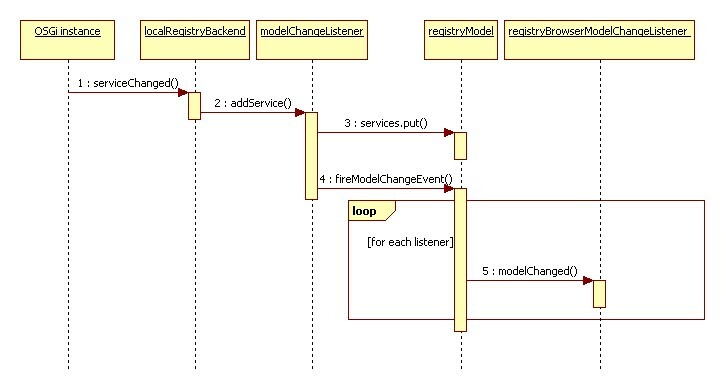 For example we can choose remote services API which is very similar to classic OSGi services API. After additional protocol/protocols will be added, we will add mechanism of expansibility for new protocols (e.g. from other plugins). Below we list possible implementations of data sources from where PDE Plug-in registry could pull the information about running OSGi framework. Requires reimplement of connection handling, develop custom protocol. Lot of work, partially done in bug 243439 . There are no operations allow to install plugin from target location. A number of existing protocols already supported with common abstraction (e.g. XMPP, socket-based comm, r-osgi, etc). one (or several) existing impls: XMPP, ECF generic (socket), others. Plus you can/could use existing code for a new impl. Dependency for target to include ECF connection layer and our custom protocol-based server. slewis comment: not sure what this means. Little effort required, once RFC 119 is complete. Will ECF ROSGi work with Equinox from Eclipse 3.2, or 3.3? Answer: No, but this is not unique to ECF, as *no* ROSGi impl will work on Equinox < 3.5 (since it depends upon the service registry hooks in OSGi 4.2/Equinox 3.5). Will ECF ROSGi work with non-Equinox? Answer: Yes. But is this really a requirement? 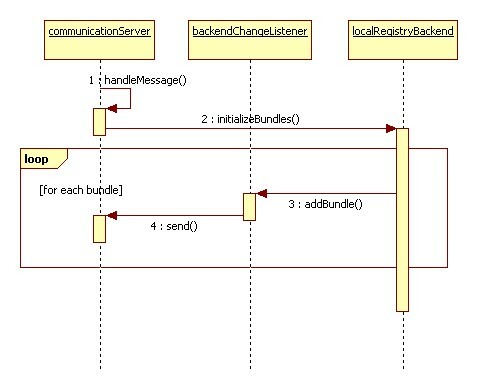 The different between them is that LocalRegsistryBackend is the service, bundle and extension points listener. RemoteRegistryBackend only calls client method to communicate with the server. 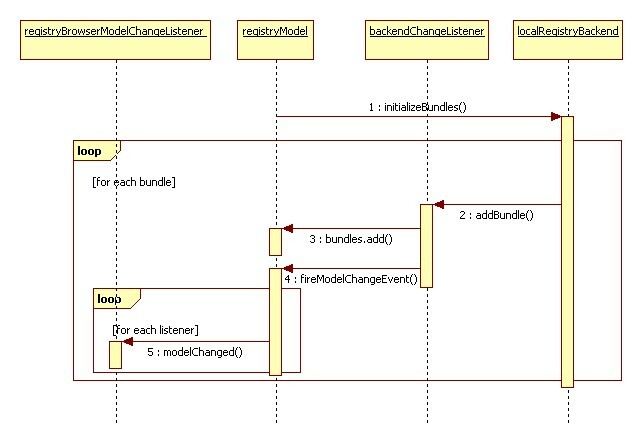 When registryModel calls initializeBundles method of remoteRegistryBackend it uses connectionClient instatnce to get inforamtion about bundles form the server. For each response new readerThread is created and it calls client’s receiveEvent method. The rest steps are the same as in the local bundles initialization. Server has LocalRegistryBackend insatnce to get information about local bundles. New implementation of the RegistryBackendListener does not update local model and view but only calls send() method of the ConnectionClient class. You must add these plugins to your application. After that in plugin registry view you should see model from server application. R-osgi plugin adds new implementation of RegistryBackend - RosgiRegistryBackend. When rosgi plugin starts it register RosgiRegistryHost remote service. RosgiRegistryBackend connects with server's RosgiRegistryHost remote service. 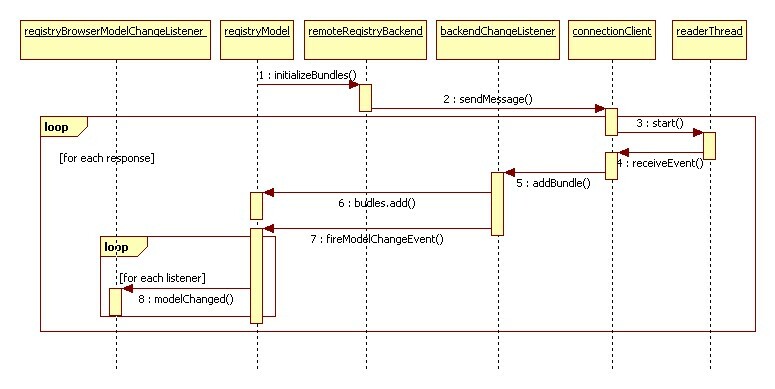 After that RosgiRegistryBackend register its own remote service which is a RegistryModel's BackendChangeListener. On the server side RosgiRegistryHost creates instance of LocalRegistryBackend and connects with remote service registered by RosgiRegistryBackend. Next, RosgiRegistryHost sets that remote service as listener for LocalRegistryBackend. Now every operation on RegsitryBackend is delegated by RosgiRegistryBackend to RosgiRegistryHost remote service. Then it calls methods from LocalRegsitryBackend which calls methods from its listener (BackendChangeListener remote service). This page was last modified 08:01, 20 August 2009 by Wojciech Galanciak. Based on work by Scott Lewis, Jacek Pospychala and Mateusz Matela.